The UN Human Rights Council, 17th Session, on Friday, 17 June, adopted a resolution (A/HRC/17/L.13) on Migrants and Asylum Seekers Fleeing from Events in North Africa. The Resolution recalls states’ obligations under human rights, humanitarian, and refugee law, including the obligation of non-refoulement and called for ships patrolling the Mediterranean Sea to provide assistance to non-seaworthy boats leaving North Africa. In favour (32): Angola; Argentina; Bahrain; Bangladesh; Brazil; Burkina Faso; Cameroon; Chile; China; Cuba; Djibouti; Ecuador; Gabon; Ghana; Guatemala; Jordan; Kyrgyzstan; Malaysia; Maldives; Mauritania; Mauritius; Mexico; Nigeria; Pakistan; Qatar; Russian Federation; Saudi Arabia; Senegal; Thailand; Uganda; Uruguay and Zambia. Against (14): Belgium; France; Hungary; Japan; Norway; Poland; Republic of Korea; Republic of Moldova; Slovakia; Spain; Switzerland; Ukraine; United Kingdom and United States. “OSITADINMA ANAEDU (Nigeria), introducing draft resolution L.13, said the African Group recognized that due to the recent crisis situation in North Africa, migrants had suffered great hardship. Migrants were fleeing, not flowing out of North Africa. People were running away because their lives were at risk. Other root causes for migration did not apply in this case. This resolution had been difficult to establish. Nigeria thanked all partners for their efforts in developing the draft resolution. The information emanating from North Africa was such that while neighboring countries did quite a lot in accommodating migrants, there were substantial difficulties in traveling from North Africa. Some people had even died at sea. Nigeria took note that some countries did provide assistance through their offices of migration or other mechanisms. The hardship suffered by migrants should be investigated in order to clarify the problems that arose and ensure this situation was not repeated. Nigeria believed that the Special Rapporteur, working with the High Commissioner, would be able to provide information about how to deal with such a situation in the future. The African Group would appreciate if the draft resolution would be approved by consensus. ANDRAS DEKANY (Hungary), speaking on behalf of the European Union in an explanation of the vote before the vote, noted that the European Union had assisted greatly with the humanitarian effort in Libya. From the outset the European Union had been at the forefront of humanitarian response. The European Union had been active in repatriating third country nationals. This had been vital in reducing the stress on neighboring countries. The draft text was circulated late. The European Union had engaged in a constructive spirit on the text, while retaining a specific focus that would address the issue at stake in a more balanced and legally accurate manner, notably when referring to issues related to refugee law and law of the sea. It noted that this was particularly true with regard to PP7 and operative paragraphs, which introduced new language that was not consistent with public international law. The resolution did not capture the multi-dimensional aspects of the problem. There was no reference to the overall human rights situation in the region, and therefore the root causes of the plight of migrants. The resolution did not refer to the responsibility of criminal traffickers and continued to characterize the situation in an unbalanced way. The European Union and its Member States had continued to observe the principle of non-refoulement. Not a single refugee had been subjected to refoulement. The European Union called for a vote and noted that it would vote against the resolution. Click here for UN News Centre summary. Click here for the AFTERNOON 17 June 2011 summary of the HRC meeting. US Govt Chartered Ferry to Attempt Evacuation of US Citizens from Tripoli Wednesday Morning, 23 Feb.
Click here for full US Embassy Tripoli Warden Message. 2. (SBU) Maltese Ambassador Joseph Cassar pulled P/E Chief aside for a conversation on illegal migration as the latter penned a message in the condolences book for the recently deceased Sir Anthony Mamo, the first President of Malta. Saying it had been “a bad week”, Cassar noted that more than 70 illegal migrants had made landfall and requested asylum in Malta during a single 48-hour period earlier this week. More than half of the 70 individuals claimed to have departed from Libya’s coast, prompting Valletta to task its embassy in Tripoli to reiterate requests that the GOL increase patrols in its Search and Rescue area (SAR). Cassar noted that more vessels transporting illegal migrants appear to be calling via satellite telephones to claim distress and request assistance immediately after entering Malta’s SAR. He suggested that they did so to mitigate the chance that they would founder before being rescued. 3. (SBU) Cassar said the GOL’s response to the Maltese demarche had been “disappointing”. He noted that the unexpected death six weeks ago of Engineer Fawzi Ghariba, former Director of International Cooperation for Libya’s Port Authority-equivalent and a key interlocutor on counter-migration efforts, had negatively impacted the GOL’s responsiveness on illegal migration issues at a critical time. (Note: Launches from Libya of vessels transporting illegal migrants typically increase in spring/summer months to take advantage of improved weather and sea conditions. End note.) Describing Ghariba’s operating style as “American”, he said the late official played a key role in finalizing recent Malta-Libya and Italy-Malta bilateral cooperation agreements on migration issues (reftel). More importantly, Ghariba was an energetic and efficient operator and one of the only GOL officials who approached illegal migration with any sense of urgency. In several cases, Ghariba had galvanized the GOL to deal with migration issues and prompted disparate GOL entities to coordinate their efforts through the force of his personality. On instructions from Valletta, Cassar has asked the GOL several times when a successor to Ghariba might be identified; however, the GOL has demurred, saying it would be unseemly to rush to appoint a replacement. Click here and here for full Cable. ¶2. (C) At a recent meeting hosted by the U.K. Ambassador to discuss counterterrorism engagement efforts, Italian Ambassador Francesco Trupiani expressed profound frustration with difficulties Italy had encountered in trying to cooperate with the GOL on counterterrorism and combatting illegal migration (Italy views the two issues as being linked). Italy was alarmed by the marked increase in the number of illegal migrants that had arrived in Italy – primarily on the island of Lampedusa – from Libya. By way of example, he offered that 1,300 Tunisian illegal migrants traveled from Libya to Italy in 2007. In 2008, 5,900 Tunisians made landfall in Italy after departing from Libya’s coast. The number of migrants from Somalia – “a derelict state” – who had arrived in Italy increased from 5,110 in 2007 to 31,764 in 2008. The number of Nigerians had increased threefold and featured a heavy contingent of prostitutes and narco-traffickers. LIBYA DELAYING COOPERATION TO LEVERAGE EU FRAMEWORK NEGOTIATIONS? ¶3. (C) Noting that smuggling illegal migrants was highly profitable, that the GOL claimed to exercise tight control over travel within Libya, and that senior regime officials traditionally had a direct stake in highly lucrative enterprises (licit and otherwise), Trupiani said it was “implausible” that large numbers of illegal migrants had transited Libya without at least the tacit consent of GOL officials. The substantial increase in the number of illegal migrants meant a corresponding increase in the amount of money involved. He speculated that there could be a “logical nexus” between smuggling of illegal migrants, arms trafficking and movement of terrorists, and lamented that no one appeared to be holding the GOL accountable for its failure to more effectively address those inter-related problems. Worse, the GOL appeared to be deliberately delaying engagement with Italy and other European partners to leverage negotiations for a Libya-EU Framework Agreement (EU External Affairs Commissioner Benita Ferrero-Waldner was in Tripoli February 9-10 for the latest round of negotiations). Click here for US Military article. A joint maritime military exercise known as Exercise Phoenix Express 2010 began last week. This exercise includes training of the Moroccan and Senegalese military by US and Spanish military personnel. 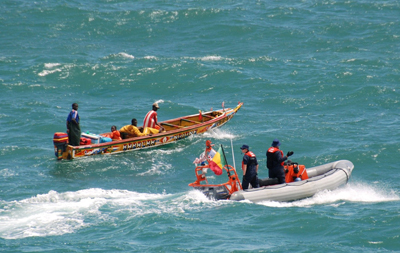 According to an Africom press release, Moroccan and Senegalese Maritime Interdiction Operations Teams are being trained on tactics, techniques, and procedures associated with Maritime Interdiction Operations. Last month Spanish and US naval forces were involved in similar training exercises off the coast of Senegal under Africom’s Africa Partnership Station. Click here for El Pais article about Spain’s military’s return to Africa. Click here and here for Africom press releases. Click here for US Naval Forces Africa press release. A US Naval vessel participating in counterpiracy operations off the Somali coast rescued 30 Somali men, women, and children approximately 100 miles of the Somali coast on 25 March. The Somalis had been drifting for four days after their boat’s motors stopped working. The Somalis were returned to Somalia. The Los Angeles Times reports on the construction of a boat in Cap Haitien, Haiti and preparations being made by some earthquake survivors to flee the country for the US. Click here for article and here for photos and audio. Click here for Christian Science Monitor article regarding recent US preparations for possible surge of Haitian boat people. 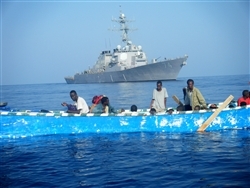 While there have been few, if any, Haitians attempting to leave Haiti since the 12 January earthquake, and while the US has deployed a significant naval force in Haitian waters for the purpose of providing humanitarian relief, the deployment of the US Coast Guard vessels serves the dual purpose of discouraging boat people. The US is also erecting tents and other facilities at the Guantanamo Naval Base in Cuba in preparation for the mass detention of thousands of Haitians should there be a sudden surge in departures from Haiti. “There are growing concerns that the crisis conditions in Haiti may result in mass migration from the country. Not only has there been massive displacement of people caused by the earthquake, but observers of the situation warn of potential and widespread lawlessness as well as outbreaks of disease. These health, safety, and security factors—individually or in combination—could trigger an exodus of Haitians seeking refuge in nearby countries, including the United States. At least five federal agencies now handle Haitian migrants: DHS’s Coast Guard (interdiction); Customs and Border Protection (apprehensions and inspections); Immigration and Customs Enforcement (detention); U.S. Citizenship and Immigration Services (credible fear determination); and DOJ’s EOIR (asylum and removal hearings). DHS would take the lead in handling a potential mass migration and has long had a set of operational plans in place to respond to such a situation. In her TPS announcement, Secretary Napolitano warned of the consequences of Haitians fleeing to the United States. At this moment of tragedy in Haiti it is tempting for people suffering in the aftermath of the earthquake to seek refuge elsewhere. But attempting to leave Haiti now will only bring more hardship to the Haitian people and nation…. It is important to note that TPS will apply only to those individuals who were in the United States as of January 12, 2010. Those who attempt to travel to the United States after January 12, 2010 will not be eligible for TPS and will be repatriated. Click here for US Congressional Research Service Report.